I can’t help but feel like Luigi’s Mansion is an underappreciated gem of the Gamecube era. 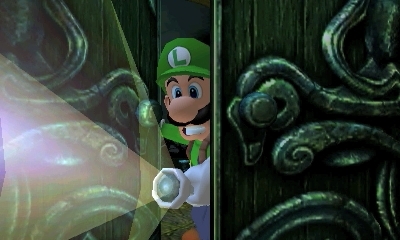 People look back so fondly of other Gamecube titles such as The Legend of Zelda: The Wind Waker and Super Smash Bros. Melee, but not many seem to remember how brilliant Luigi’s Mansion was. Nintendo must be aware though, as they have remade the game for the Nintendo 3DS, 17 long years after its debut on the Gamecube. 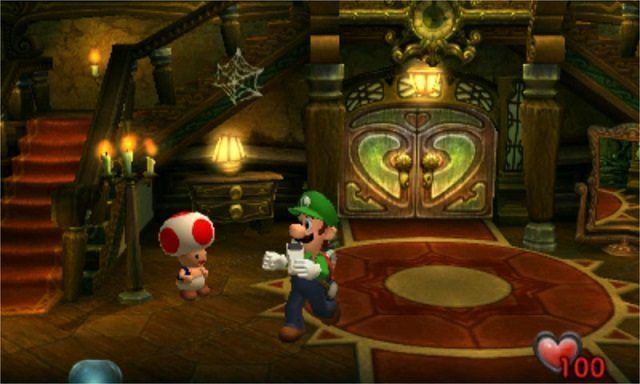 Luigi’s Mansion is an odd but thoroughly enjoyable experience, placing the green-clad plumber in a haunted Mansion in which he must capture ghosts in a vacuum in order to find Mario. Luigi’s Mansion is by no means perfect, but the charming characters and addictive gameplay is sure to keep you interested throughout the journey. The story of Luigi’s Mansion is remarkably silly and simple. Luigi has been awarded a mansion in a contest that he oddly enough never entered (is that not a red flag?) and decides to meet up with Mario at his sweet new crib. When Luigi arrives, Mario is nowhere to be found, leaving Luigi alone to enter the spooky mansion on a quest to find him. 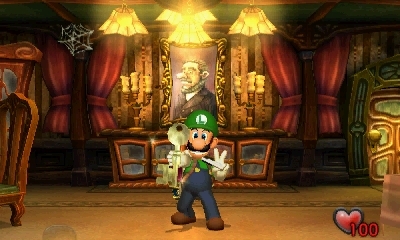 Luigi quickly realises that the mansion is riddled with ghosts, and teams up with Professor E. Gadd in order to clear out the ghosts and find his brother. The ghosts that live in the mansion were previously trapped in paintings, but King Boo has freed them, leaving Luigi no choice but to capture them with E. Gadd’s trusty vacuum the ‘Poltergust 3000’, in order to return the ghosts to their portrait forms. 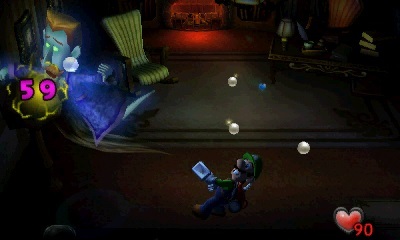 The story of Luigi’s Mansion is by no means engaging, but it serves perfectly to explain why Luigi is traipsing around a mysterious mansion with a vacuum strapped to his back. 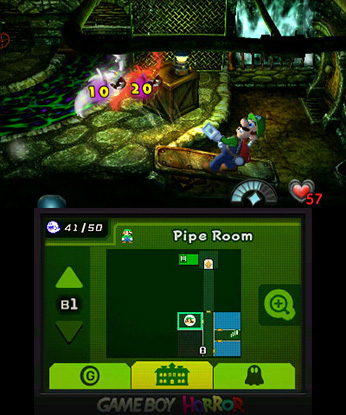 Luigi’s Mansion’s gameplay is where the game shines the brightest. You make your way throughout the rooms of the mansion, taking out ghosts and unlocking keys to progress. Ghosts can be captured by shocking them with your flashlight and revealing their health meter, before sucking away with the Poltergust 3000 as you whittle their health toward zero and capture them. Ghosts vary from simple ghosts that can be dispatched quickly, to the Portrait Ghosts that require a bit of puzzle solving before they will reveal their hearts, which then allow for them to be captured. These puzzles involve interacting with the room in one way or another, whether it be touching particular pieces of furniture, or lighting candles. For example, one of the rooms requires you to push aside the curtains, allowing for a draft to come in to the room that the prompts the Portrait Ghost to get up, exposing her weakness. When you aren’t capturing ghosts, you will spend most of your time trying to track down money, which is seemingly located everywhere throughout the house. The money has no real bearing throughout the game, only being used to determine your rank at the end of main story mode, but it’s still fun to collect the incessant amount of coins, notes and gems that can be found in the mansion. Alongside capturing the Portrait Ghosts, there are also fifty Boos that need to be captured. You only need to capture 40 of them in order to finish the game, but the willingness to collect the extra 10 will see you rewarded. There’s also a Gallery you can visit, in which you can replay Portrait Ghost battles in order to get better times, alongside a Hidden Mansion that offers a tougher experience after completing the game. Overall, Luigi’s Mansion’s gameplay is a fun time, capturing ghosts is always a frantic and fun experience, and the puzzles throughout the Mansion all feel unique and often require a bit of thinking. Akin to almost every first party Nintendo game, Luigi’s Mansion has some amiibo functionality. A Mario amiibo will turn poison mushrooms into super mushrooms, a Luigi amiibo will allow you to revive yourself once, as well as making it easier to find Speedy Spirits ghosts that drop a heap of money. 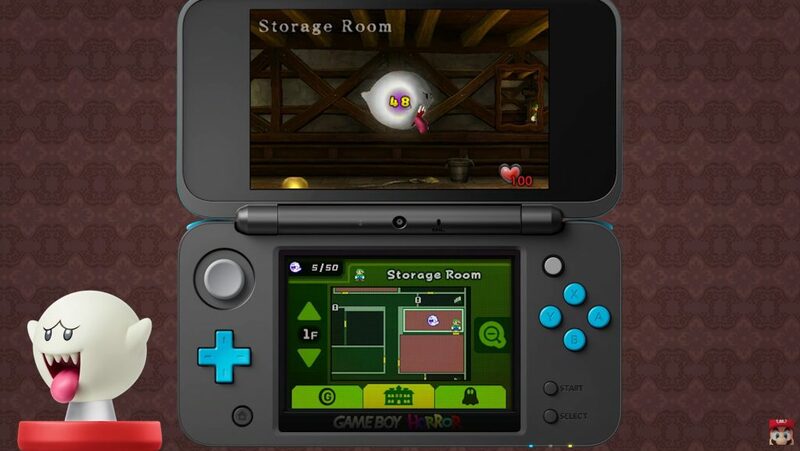 A Boo amiibo makes the quest of collecting the fifty Boo that are scattered throughout the mansion easier, allowing you to know the location of up to three of the hidden Boo, while lastly the Toad amiibo will allow Toad to heal you every time you encounter him in the game. The amiibo features serve as optional ways to make the game a little bit easier if you feel the need to do so, but in a game as simple as Luigi’s Mansion, these additional features aren’t particularly necessary, and overall feel a little useless. Whilst my time with Luigi’s Mansion was particularly enjoyable, I couldn’t help but take note of a few issues. Firstly, the controls are probably the biggest difficulty hurdle that Luigi’s Mansion will throw at you. Simply walking around the mansion isn’t an issue, but when it comes to quickly whipping out and aiming your flashlight or vacuum, the game’s controls become a real annoyance. I never once felt confident in my ability to pin my flashlight on ghosts, or accurately direct my Poltergust 3000 upwards to try and see if any coins lurked in the lamp on the sealing. Luigi’s Mansion is such an excellent game when it controls well, but the lack of a reliable second analog stick like the c-stick on the Gamecube controller led to more frustrating moments than I would have liked. The circle pad pro on the New Nintendo 3DS models does try to serve as a handy secondary analog stick, but the small little nub never gives you the accuracy you desire. The d-pad and gyro can also be used to control the aim of the flashlight and Poltergust, but they also fail to offer up a comfortable to control experience. The struggle against the controls was most strongly felt in the final boss battle in the game, in which quick reflexes and aiming of the vacuum are crucial. The final boss caused me less headaches than trying to manoeuvre the controls, and that simply isn’t good enough. Another gripe I have with the game is the lack of difficulty. Luigi’s Mansion’s original release was an easy enough game to begin with, but the tweaks made in this rerelease make the title even more forgiving. Money dropped when Luigi takes damage lasts almost double as long as it does in the original game, giving you plenty of time to get up and retrieve your cash with almost no penalty at all. Yes, there will be some occasions in which you will lose your money, but more often than not, there is no real punishment for taking damage other than death, which I only encountered once at the end of the game as I struggled to overcome the lacklustre controls. There is a hard mode after beating the game in the form of the Hidden Mansion, but I can’t help but find myself wishing that Luigi’s Mansion was just a little bit more challenging. Luigi’s Mansion is still a good game, but I can’t help but feel that the transition from Nintendo Gamecube to Nintendo 3DS hindered just how beautiful the game was to control. Despite the control issues, the game looks prettier than ever, with the mansion looking brilliant on the system, whether you opt to play in 3D or 2D. The characters are quirky and charming and the excellent soundtrack somehow feels spooky and silly at the same time. Whether you’re a Luigi’s Mansion veteran or a newbie wanting to see what the series has to offer, Luigi’s Mansion on 3DS still serves as an interesting and unique Nintendo experience that you should definitely try.